Now you can travel to different clubs and special events held in SG such as F1 and Zouk Out with your family, friends, or colleagues. Party bus charter services are ideal for larger groups of tourists or locals that are planning an exciting night out and hassle-free excursion. Get in party mode on the way to your favourite club dancing to the tunes you choose or sing along onboard a Party BUS with Karaoke. The Party BUS also comes with enough padding so that you’re not distracted by external sounds and noises, you can simply let the world disappear around you and enjoy the loud music and disco effects created by the laser lights and smoke machine. Just enter all the necessary details while booking and we’ll sent 1 with a professional driver waiting for you, ready to take you for a city transfer, pub crawl or even from the airport to hotel or back! As the name implies, a party bus is bigger than your typical vehicle yet smaller than huge buses. It is therefore the right size with the most appropriate passenger capacity. The ideal accommodation is for 10 pax but it could comfortably seats up to 13 pax maximum. It depends on the number of persons in your group and the company will provide the perfect ride. All you have to do is give the salient details such as your scheduled date of travel, number of passengers, and other preferences. Contemporary party buses have innovative entertainment packages. There are models that are fully equipped with LED or flat screen TV, DVD player, Karaoke, Disco effect and so much more. You can request for a particular multimedia amenity depending on your travel needs. For corporate trips we could arrange our executive Limobus 13 seater for their needed facilities in order to have a productive and hassle-free business tour in SG. Today’s party bus selections have a wide variety of trendy designs with spacious interiors. There is enough leg room to avoid cramped spaces inside the bus. You no longer have to deal with long rides and body aches because you enjoy large plush seats with reclining features. Interiors are also upholstered and carpeted depending on the type of unit you arranged for your trip. The good news is that you have the luxury of choice to select and pick the best ride for a memorable adventure in Singapore. Going around Singapore is one of the best plans you can have every year. There are remarkable night spots to explore and the weather is excellent for trips all year round. Make sure you have the best worry-free SG getaway today. Hire a party bus charter service and experience the amazing difference. 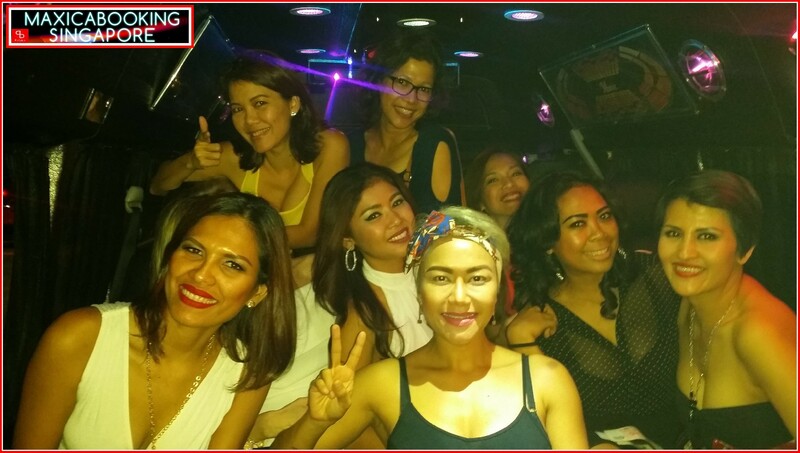 This entry was posted in Party BUS, Party BUS Transfers and tagged limo party bus, mobile party, party bus, party bus club hop, party bus transfers, party van transfer, pub crawl with party bus. Bookmark the permalink.